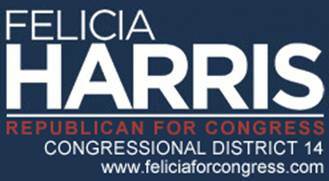 League City, TX – Having earned a position in the run-off for the Republican nomination in the newly drawn 14th Congressional District, Felicia Harris today announced the endorsements of conservative Republican Congressmen Pete Olson (TX-22) and Bill Flores (TX-17). Olson currently represents portions of Galveston County which are now included in the new 14th Congressional District and has represented northern Brazoria County since 2009. “I am very proud to endorse Felicia Harris as the strongest candidate to fight for conservative principles in Congress and defeat former Democrat Congressman Nick Lampson this November,” said Congressman Pete Olson. “I was honored to have the support of people from across our area to oust Nick Lampson in 2008 – I know what it takes to beat him. Felicia’s commitment to limited government principles, new American energy development, and a full repeal of Obamacare will give voters a clear choice in the general election. About Felicia Harris: Harris is a lifelong Texan, graduate of Texas A&M University, and earned a Juris Doctorate from the South Texas College of Law. After settling in Brazoria County more than a decade ago, she became active in her community and, to help guide the booming growth of the city, was appointed to the Pearland Economic Development Corporation in 2003 and 2005. Harris was elected to two terms on the Pearland City Council and has served as a Republican Party precinct chair for precinct 64 in Brazoria County where she helped elect conservatives like Congressman Pete Olson to office. Make no mistake, this wasn’t a tepid endorsement by Rep. Olson – in fact, I’ve rarely heard him more animated. During a conference call on the endorsements (which Rep. Flores was unable to attend), Pete stressed that Felicia was a true conservative that could take the fight to Nancy Pelosi and Debbie Wasserman Schultz, and that she could defeat Nick Lampson in the general election this November. I’ve liked Felicia as a candidate to replace Ron Paul since I first met her last fall. She is incredibly intelligent, knows the issues of that far ranging district and how to address them, is tough as nails and will not be pushed around, and is articulate and can drive the conservative agenda. When voters get to know her, they like her, as evidenced by her performance in the primary after having been outspent but not outworked. On this issue we are in agreement. Finally! Great. Now the Republican party is engaging in identity politics. Harris can take the fight to Pelosi and Wasserman Schultz because she is a woman? Isn’t that a page out of the Left’s playbook? You know, support someone based on race or gender, e.g. Pelosi and Obama. I thought Republicans supported candidates based on qualifications. I hope the irony was not lost when you wrote Harris is “incredibly intelligent” and “articulate?” Wasn’t that the Left’s reasons for voting for BO? Completely ignore a candidate’s inexperience but vote based on show. We need to look at the substance of candidates if we ever want to get out of the mess we are in. Dale, glad to hear! It’ll be good to be on the same side again. JD Law, Felicia Harris is qualified and has a record as a city council person in Pearland. I don’t know why you would think that we are talking identity politics when suggesting that she is the best candidate in this race. Please, do look at her substance. You will be very impressed. David, I was referring to Olson’s comments, not yours. Clearly saying a woman is needed to take on Pelosi, Wasserman Schultz, and the “war on women” is, in and of itself, identity politics. Read the full length press release, it’s in there. I’m open-minded and always vote based on substance. What’s in Harris’ council record that is so impressive? I do see where her opponent was named the most conservative legislator in the Houston area two sessions in a row, and received an A+ from the NRA, Texas Right to Life, and Texans for Fiscal Responsibility. That seems like good substance to me. Am I missing something? What I’d really like to know is where Ron Paul stands on this one. Has he endorsed? I know he has a HUGE following down there. Pete Olsen represents what has to be one of the most conservative districts in the country, yet he has voted to increase the debt limit at every opportunity, sounds like SJL when trying to get benefits for displaced NASA workers, is looking for ways to keep parts of Obamacare rather than to get rid of it all together, and apparently falls in line every time the Speaker asks. I supported Rep Olsen and voted for him and have been nothing but disappointed in his voting record. Thus, his support of this candidate causes me to seriously look to her opponent so as to avoid another disappointment. So…Ron Paul endorsed Randy Weber. Epic.